Our review of the Ram 1500 Laramie Longhorn made us realize just how easy it is to like a nice, well thought out pickup, so it was with more than a little excitement that we got to have a crack at another one. 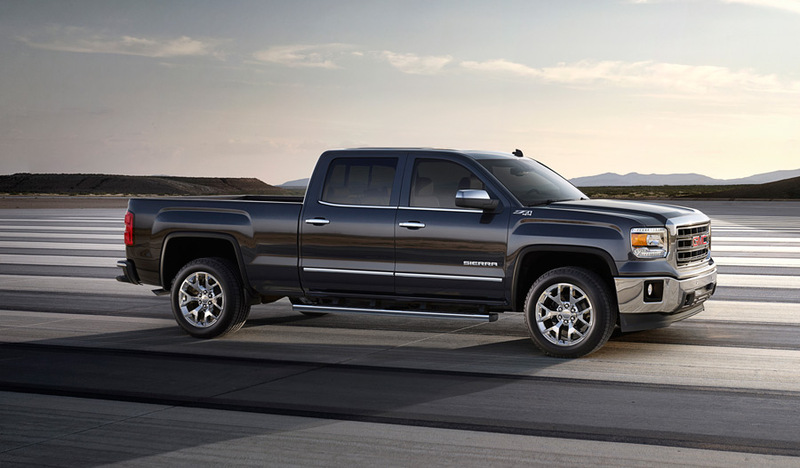 This time, the machine in question was the all new 2014 GMC Sierra. Our test truck was a 1500 SLT with crew cab, four-wheel-drive, and the towing package. 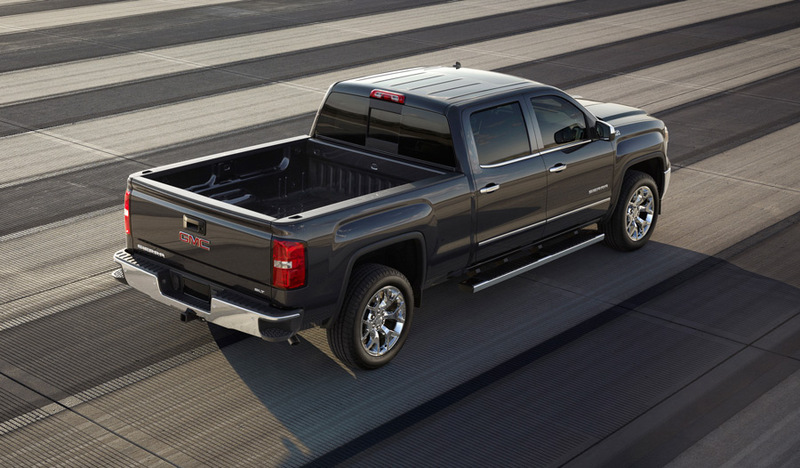 GM claims that a slight majority of GMC owners tow, and this vehicle was clearly made with that in mind, but the rest of the Sierra also has a purposeful layout that compliments the pulling power of its drivetrain, which makes for a satisfying package. 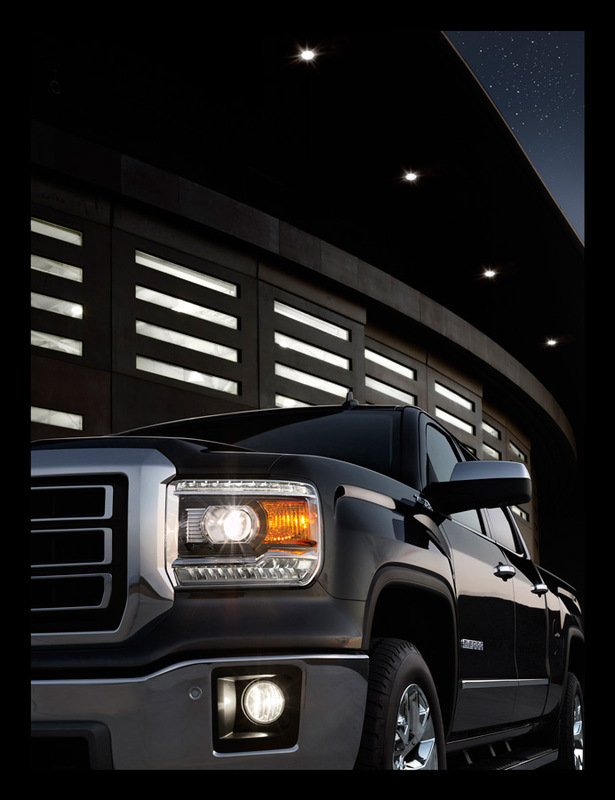 One of GMC’s biggest boasts about the Sierra is also the fuel economy. It’s not a traditional selling point on big pickups, but the Sierra beats out both the comparable Ford and Chrysler products, and GMC seems to have tried pretty hard to get it that way, so it’s worth bragging about. Our test vehicle had the mid-range 5.3 liter V-8, just above the 4.3 liter V-6 (which in itself is a capable unit for basic towing), and features aluminum block and head along with direct injection and Active Fuel Management, which knocks the V-8 over to four-cylinder power for light load driving. 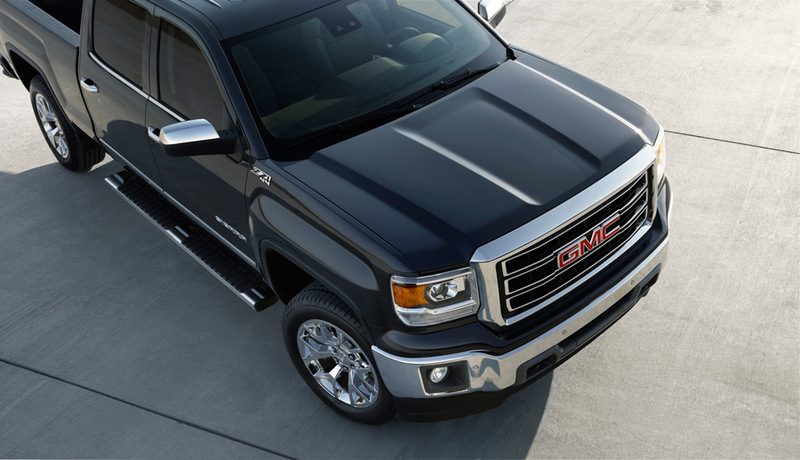 This technology and weight saving, including an aluminum hood that saved 17 pounds, contributes to the admirable 22 miles per gallon on the highway. With the towing package, you get 11,500 pounds of towing capacity, while without it you still have an ample 9,600. Though a decent trailer or good-sized boat would be well within the Sierra’s limits, we still couldn’t help but want a little more in the power department, as the weight of this big fat pickup clearly puts all of its 355 horses and 383 lb/ft of torque to work. There’s a fix for that, however, as the Sierra can also be had with a 6.2 liter motor that makes 420 horsepower and 460 lb/ft of torque. That said, the normal 5.3 is a thoroughly capable machine. Apparently, 60% of Sierra buyers go for the crew cab, and this is a good thing because people can further enjoy the impressive environment that is the Sierra’s interior. 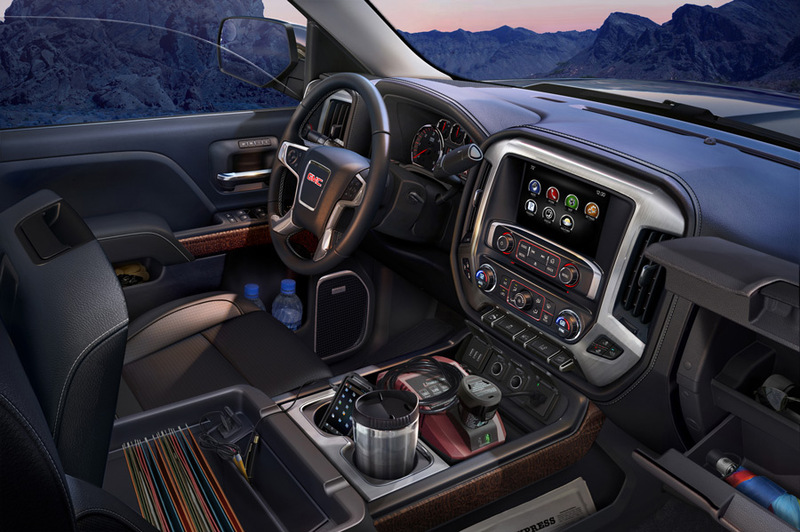 It’s leaps and bounds over the last Sierra, making for a space that manages to be modern and comfortable but also practical and rugged all at the same time. There are big storage compartments all over, including the doors, center stack, and second glove box. There are heated and cooled seats and a sunroof. 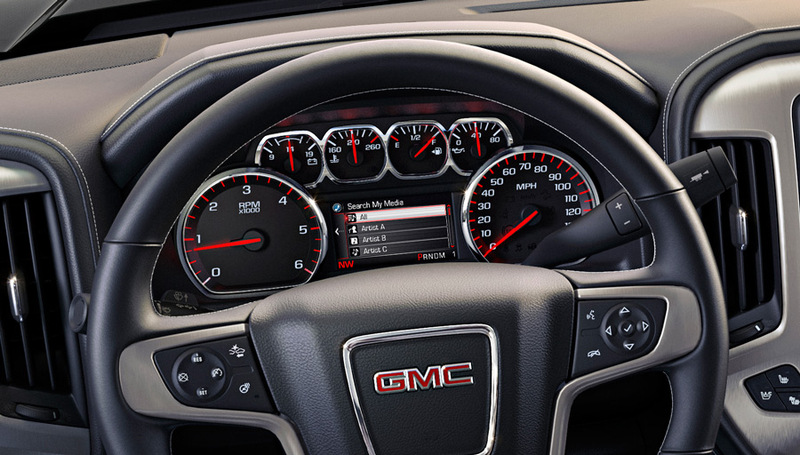 There are six gauges clustered around a 4.2-inch info screen, and all are very easy to read. There are three USB ports, two cigarette lighter outlets, and one actual 110V outlet. Of course, there is also a high level of connectivity with GM’s IntelliLink system as well as the comforting front and rear parking cameras. 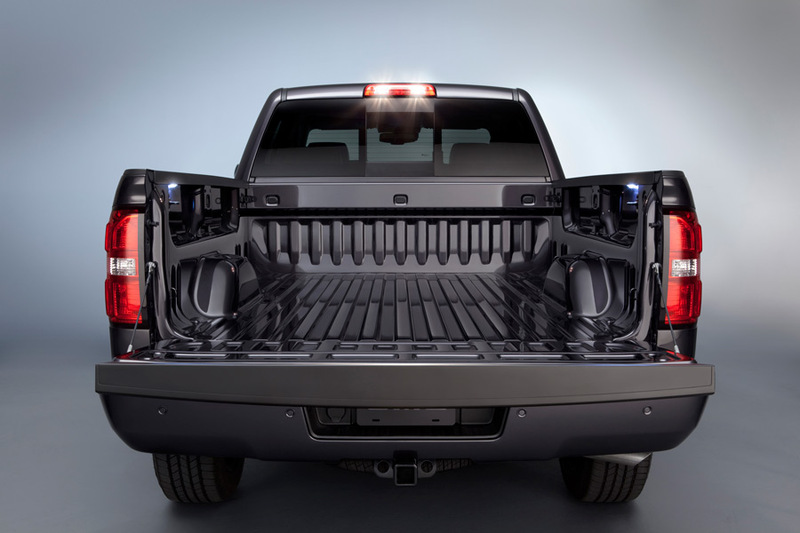 This is therefore a capable truck both inside and out, as the practicality of the interior is matched out back in the bed by a standard tie-down system. And for those with more to throw in the back, you can upgrade to a longer bed, up to 6’6” from 5’8”. With such goodies, it’s hard not to imagine how pleasant a long haul to the track could actually be. It would probably be as pleasant as anywhere, because the Sierra is remarkably quiet on the road, no doubt helped by its low-rolling-resistance tires. With the four-wheel-drive, it’s also sure to be a competent off-roader, and overall it’s a very comfortable affair driving around in this otherwise pretty utilitarian-looking truck. It’s no luxury car, but you’d be surprised how close it really gets. 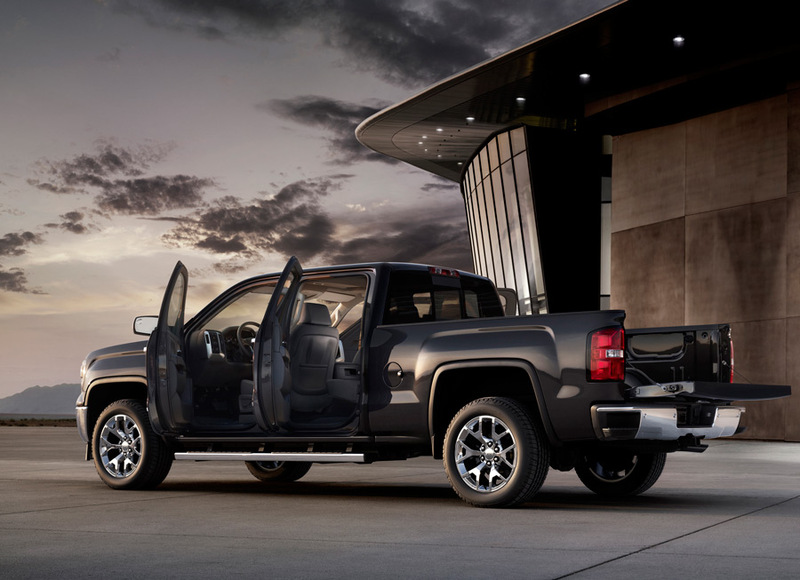 Spending quality time with a modern pickup like the 2014 GMC Sierra 1500 4WD SLT is a reminder that pickups are no longer utilitarian tools. Sure, they are as practical as ever, but they are also useful as a family tool, date nights and other jobs typically left to family sedans. After a short week with the Sierra, we were left wanting much more. 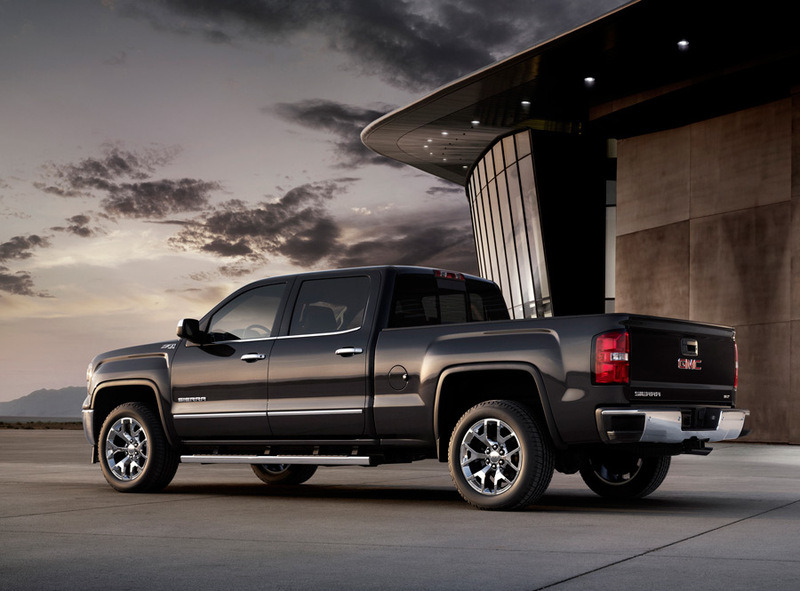 For more information, visit GMC.com.